The Sub-Mariner – known to his friends as Prince Namor – is one of the first superheroes, and probably the first super anti-hero. He was created by Bill Everett and introduced in 1939 by Timely Comics (the publisher now known as Marvel). 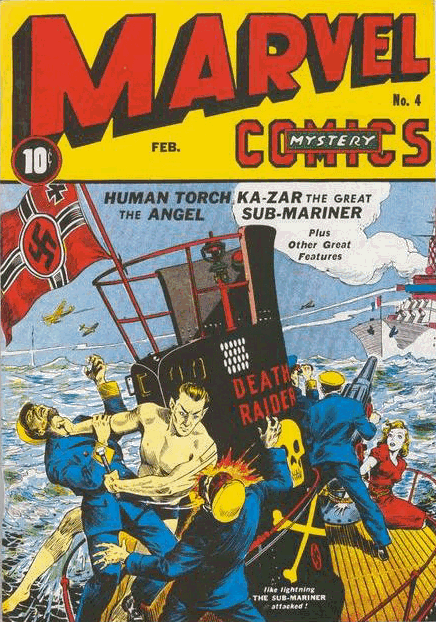 He was the half-human champion of undersea Atlantis, seeking vengeance upon the surface dwellers of America, though he quickly turned his wrath against the Axis, becoming one of the publisher’s most popular characters. In addition to strength and breathing underwater, he could fly (a popular new super-power at the time) and duplicate the abilities of any marine species (a power his writers have since discarded). He was one of the inspirations for Aquaman (who appeared a couple years later) and for the 1970s TV series Man from Atlantis. His popularity waned along with other superheroes after World War 2; although he has had periodic revivals in the decades since then, and remains a stock character in the Marvel Universe, his popularity has never returned to that early high. He was originally scheduled to enter the Public Domain at the end of 1995.